The World in a Shell as Walk-in-sculpture at the Westerpark in Amsterdam . Inspired by Jared Diamond's remark that the largest mistake humanity ever made was settling down in agricultural and later industrial societies, and the personal experience that continuous movement seems to be the lifestyle fitting best with human needs and aspirations nomadism is a central theme in the development of the World in a Shell - polliniferous project. Superficially it seems to contradict the common opinion and long-term policy of many governments to forcibly settle down the nomads and provide them and their other citizens with a few square meters of living space in suburbia, ghetto's or shantytowns. Some people are celebrating the 21-century as the century of the city as more than half of the human population is now living in cities suggesting that their inhabitants have a better and fuller life as before. But they overlook the unstable side of the cities, their lack of a healthy social cohesion and vigorous communities, their gangs and crimes, and that the influx of people is not an act of free choice but a consequence of poverty, exploitation and in many cases a forced movement instigated by government policies and land grabbing by multinationals and the rich. Nomadism, modern nomadism is on the rise and climate change and the unequal distribution of wealth on a local and global scale will only push more people to move from their ancestral lands just simply to survive. It looks like that the ecological refugee will be more characteristic of the 21 century than the happy human beehive of the city propagators. Also in the western world more and more people are on the move. Some of them, the e-culture nomads, use computer technology and the Internet to be able to work at any place they fancy. Others, the vast majority of the migrants have less choice. Companies want their employees to be flexible and move to wherever the companiesb profits dictate them to go. Then there is this vast and growing river of cheap labourers that despite fences, barbed wire, persecution, discrimination and other forms of inhuman treatment flock to the bgold coveredb streets of the metropoles, where as modern, voluntary slaves they have to live on the crumbs of the mighty. One can hardly call them nomads in a traditional sense as they have hardly any control over their lives nor their environment but still people are on a massive scale on the move and it is high time not to try to contain these migrations but to use the human resources to develop tools and technology for a modern form of nomadism. Part of these efforts should entail to develop mobile living and working units that are durable and can function independently of their environment. As in a decent nomadic technology, these inventions should not harm the environment or leave a lasting imprint, while at the same time it should stimulate open borders and true intercultural meetings. .
Folding out the World in a Shell for exhibition at the Netherlands Architecture institute in Rotterdam . The polliniferous project and the World in a Shell wants to be just that, an example of what modern nomadism could be, a living cultural heritage for the 21st century with roots going back to the forms of civilization that have proven to be the most lasting and most in tune with the environment and the other sentient beings. The polliniferous project is an investigation into essentials that enable an autonomous, mobile and sustainable blifestyleb, something potentially desirable for the twenty first century world citizens. Point of departure is on the one hand the issues arising from a technology perspective and on the other the richness of tacit knowledge of indigenous cultures with a nomadic past. Most interesting will be itbs juxtaposition and in how far these two very different fields can cross-pollinate each other. .
WiaS at the Westerpark in Amsterdam at daylight . The WiaS project is a one-off art performance, dedicated to the questions of global sustainability. "Best of the West" in an open-ended dialogue with indigenous cultures, who have been proven for millennia to master a sustainable and balanced life within themselves and their surroundings. Through an artistically inspired and specially designed autonomous habitat that is able to travel to the most remote corners of the world, this idea will physically manifest. 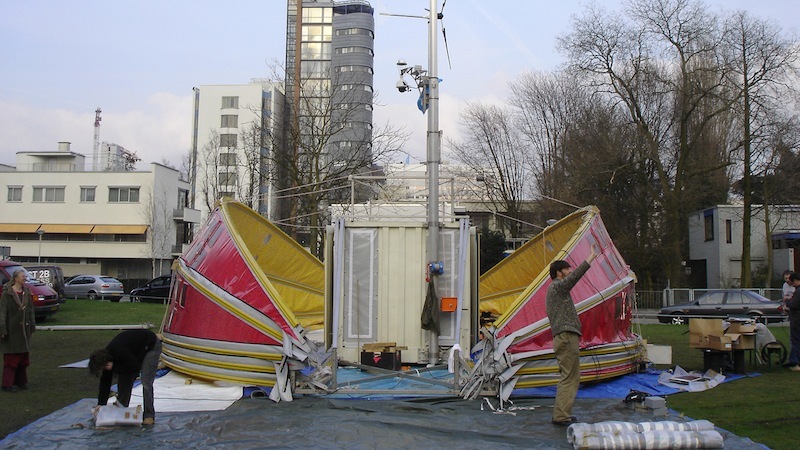 Through an innovative intervention model, the artist developed over a period of four years at the Delft University for Technology in the Netherlands a most compact, mobile and energy autarkic installation. This installation is in so far unique because it is based on the dimensions of a standard sea container, yet folds out to be seven-fold of its original size. The package unfolds into a self-sufficient and energy-independent infrastructure that facilitates multifunctional applications in the most diverse climates and geographical environments. 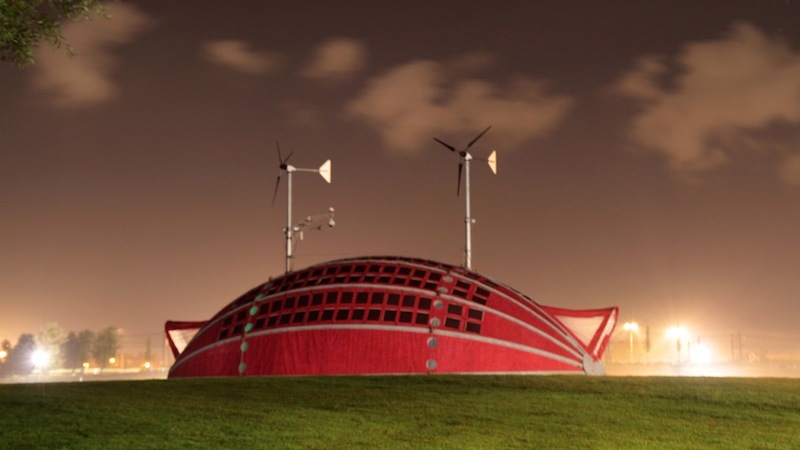 The immense energy storage is fuelled by renewable energy (wind and solar) and utilizes technologies that can be used without degrading either the environment or the values and lifestyles of the peoples it visits. For this a multiplicity of inventions have been specially developed reaching from water recycling installation to a bplug-and-playb interior with digital interface, just to name the most obvious. Altogether 75 grants and sponsors have been contributing and approximately 50 man-years of labour by highly intelligent people as well as outstanding engineering offices invested in WiaS. The overall concept and the wealth of ideas and technologies that have been practically realized are apparently decennia ahead of its time. 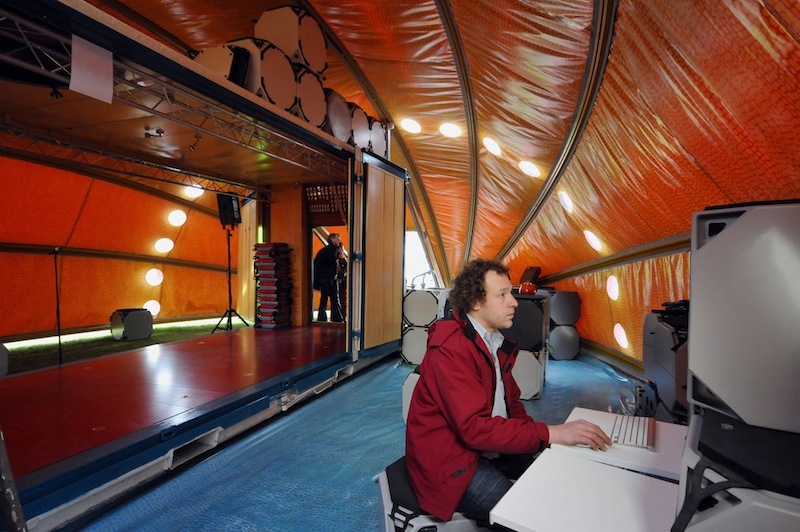 Inside over-view of the World in a Shell at the Netherlands Architecture institute in Rotterdam . Technology advancement for its own sake was not the final goal more the means to an end by questioning outdated paradigms in the development phase and to unfold alternative design processes. Ute Meta-Bauer commented in this regard at the Seminar "Art-Architecture-Science Collaboration in Sustainability", part of the WiaS Exhibition at the Netherlands Architecture Institute (NAi) and V2, "I recommend (the TUDelft)... to respect and also to recognize stimulating inspirations, that very often comes from not exactly the fields where we expect them to come from". The predominant subject of the project is the exchange of ideas and to generate synergy with interdisciplinary knowledge to suggest all-inclusive solutions in regards to autonomy and decentralization. In a practical sense WiaS functions as a self-sufficient art laboratory deployed to collect and tell stories. On invitation from a small Bushmen (San) community in the Kalahari Desert and by the Inuit Mayor of Ilulissat in Greenland, WiaS will serve as basis for interactive media projects with the local population. Focusing on human sustainability with the focus on survival and suicide, while the later is not part of their original vocabulary. In a time period of six month a bcoming of age media projectb with the title "WHILE THE GODS ARE ABSENT" will take place in the Kalahari. WiaS aesthetic and superb acoustic will allow for maximum inspiration when transformed into a cinema, a theatre for performances, workshops on film and multimedia, including an all-round basis for a fiction-film production in the middle of nowhere. .
"While the Gods are absent" with tea drinking San close to the Tsodilo Hills in the Kalahari Desert, Botswana (impression) . Their art for survival will stun the western public already in "the making of". The results of the joint actions will provide deep insights by shedding limelight on their happiness, fears and the meaning of life of "the other". The essence of all happenings if experienced or created in form of unica, (pictures, drawings, recordings, stories and self-representations) will be collected and stored and at the same time WiaS develops into a treasure box. WiaS moves on the interface of design, architecture, filmmaking and cutting edge experiments in a contemporary art context. 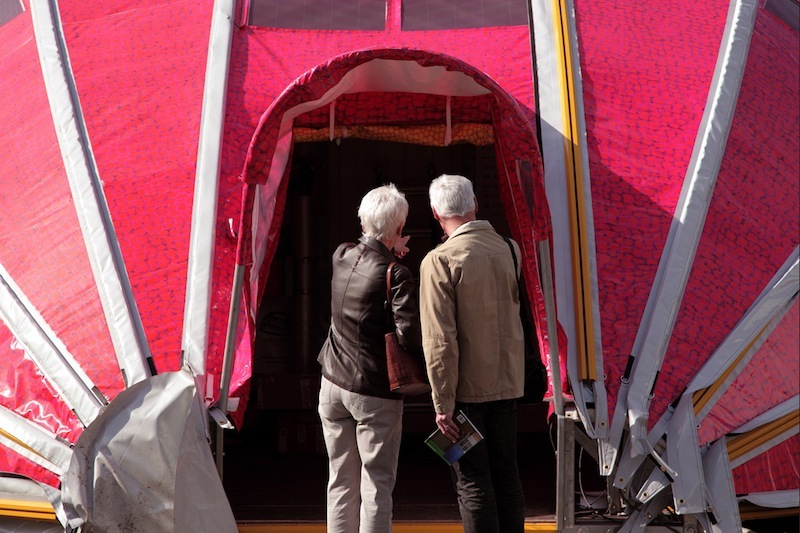 From events at the previous exhibitions of WiaS at the Netherlands Architecture Institute and V2 in Rotterdam and with PICNIC in Amsterdam with 6000 visitors in six weeks one can affirm that WiaS presents a low threshold "walk-in-sculpture". It displays new territories and potentials for presentation in an urban environment, provides new ways of seeing and experiences and draws an increasingly diverse and wide spectrum of visitors of all ages. In the context of a symbiotic adventure, philosophy, romantic and utopia can simply be mediated to the visitors and make them start dreaming. WiaS is timeless and independent from scarce wall and exhibition surfaces in musea and art events. .
WiaS this low threshold exhibition attracts a wide variety of visitors . All images are courtesy of Hans Kalliwoda / Blindpainters Foundation . Hans Kalliwoda's work has since the mid 80's focused on the integration of the spectators into his art works, installations and interventions. His potent mixture of aesthetic and conceptual work has over the years been exhibited in numerous Galleries, Musea and public spaces around the world. 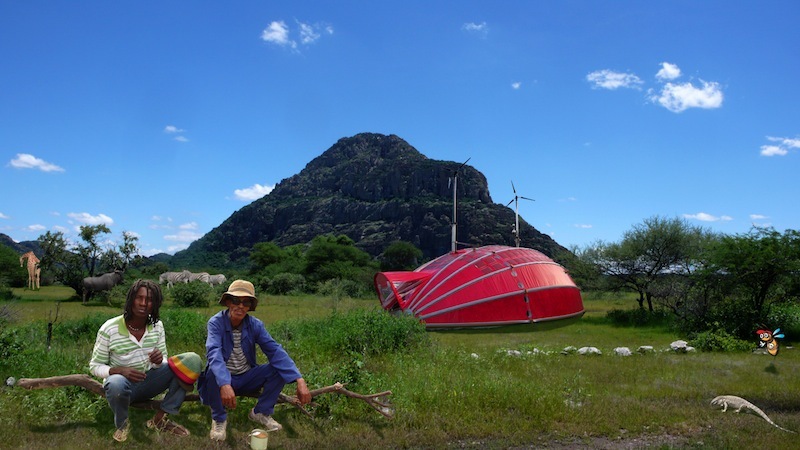 His latest project the World in a Shell - polliniferous project (WiaS) is also a highly personal accomplishment, in which Kalliwoda continues decades-long tradition of travel and exchange. Much has happened since he first bicycled across Africa in 1984. His participatory painting bought by a blind lady at a gallery showing, 'The mobile artist and his drive-in residence' and 'Living in a shoebox in the middle of the road' installations and the 'European-art-train project' showing on 23 European railway stations. 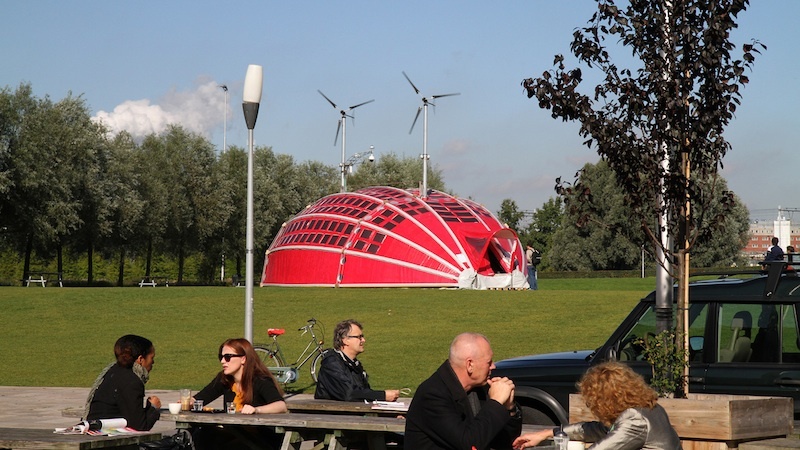 Also, his intervention projects that stimulated Delft University for Technology new paradigms and programs revealing the thrill of exchange and always invites people into his art. Indeed, his WiaS turns conventional notions of visitor-and-host on its head as he offers hospitality to those who find his extraordinary vehicle - a sort of Earth-bound spaceship - in their back yard. With the focus on autonomy and mobility he plays the guinea pig of his own experiments. New ambiguous ventures with the San (Bushmen) and the Inuit people will bring a new facet of his work to life. As he creates low threshold situations, aiming the works to be accessible to a truly broad audience, these distant cultures are ready to receive him and offered to host his projects. Thanks to his curatorial experiences, he also invents and tests innovative mediation formats that lead us to experience new models of exhibition-making that are relevant to our time. He describes WiaS as being a dream-box where visitors start to fantasise and discover the treasures he creates and collects. With his interactive art and symbiotic adventures, Kalliwoda brings romanticism and utopia into the reality of the here and now. With his research he is enrolled into the PhDArts program at the Royal Academy of Art Den Hague / University of Leiden.